I've been playing around with Google's new social network, Google+ a bit and am wondering if anyone on a2k has gotten on yet and if so what you thought about it. I like the circles idea. It's like a cleaner more usable Facebook with non-mutual follows. The circles implementation is nice for sharing with smaller circles but currently doesn't do much to help you manage your perusal with them as filters (i.e. you have only global stream then circles, but you can't do things like exclude a certain circle from the default stream etc right now). The hangouts are probably the biggest new thing they bring to the table, it's certainly the best major implementation of video chat but I've only played with that with Nick a bit and probably won't use it till more folks I know offline are on there. This photo sums up part of what I want: a cross between following people and subject matter (e.g. a lot of people I follow for only a subset of what they say). I'm most interested in tailoring output -- there are people who are very interested in what the kid has been up to and those who couldn't care less, those who are local and so would like to know about the great new restaurant and those who live on the other side of the world, etc. For those scenarios it's a great match. For me, there's little I'd want to say to more than one person that I wouldn't want to say to everyone so the problem for me is that I want people to be able to filter that better. For example, most of my close family and friends aren't interested in certain tech subjects, but they aren't posts I want to hide from the public, just subjects that I want those who follow me to be able to exclude. It'd be tough to pull off, but my holy grail is to be able to better filter by subject. I'd love to be able to post all the geek crap I want to geeks and not make friends want to unsubscribe but at the same time I want the posts to be publicly accessible (anything you post to a circle is not public). 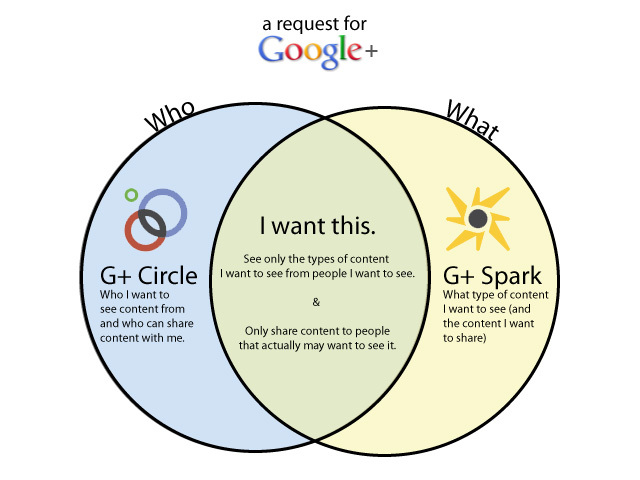 If your social graph moves over there I think the circles concept would work very well for your use case though. That remains to be seen (whether it will go mainstream like FB) but it's past 20 million users already without being fully open. I haven't gone that route yet. It sounds complicated. BTW, I hate Facebook. Hate it with a passion and go there only if I get an e-mail telling me someobody's been writing on my wall or something like that. 1) The interface is clean and showcases Google's ongoing commitment to user experience research. 2) The circles are essentially what Facebook groups tried to be minus the extra steps. 3) The ease of adding/separating known email addresses from my address book into the various circles is a nice touch. On the whole I haven't found much to complain about yet, but as I said it's only been a few days. Groups and Lists. FB swung twice on this one so far and I agree with you about the + UI being more cleanly implemented on this particularly. Are self invites welcome now? I think that I 'm about to join it. thru a 2nd Amendment forum. I dunno how it works yet. I'm in (I've actually added you, Robert). I had been dallying with it, had joined and done squat, when I got a notification that someone loved a blog post of mine, and shared it. A fan? More than one? Wacky (and yes, I know, this can happen via FB, but the liking/commenting thing pulled me in faster). the results of adopting Google + ?? I have tried to get on there, but have not been able to come close. I can invite you if you want, PM me a gmail address for the invite. I am there. I have invited family to join me, so far. No. But I've been listening to Leo Laporte and the TWIT gang talk about it. Still not sure the raison d'etre of the whole thing. Is it by invitation only like Gmail used to be?